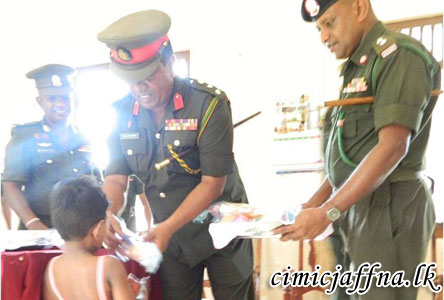 In recognition of civic-oriented welfare projects being carried out by the Army in Jaffna, “We Are One Sri Lanka”, an organization based in UK showed its solidarity by donating 18 computers to Security Force Jaffna (SF-J) on Sunday (09) morning. Mr. Mohan Samarasinghe representing the organization handed over the computers, each to the value of Rs. 80,000/=, to Major General Priyatha Jayasundara, General Officer Commanding 52 Division at the “Harmony Centre” at Thalayalai, Kokuvil East. Computers will be used to give training to Jaffna children on Information Technology at the Harmony Centre established on concept of Commander SF-J Major General Udaya Perera with purpose of helping people of Jaffna on requirements in spheres of education, health, fisheries, women empowerment and so on. The donation was coordinated by Commanding Officer 6th Sri Lanka Signal Corps Lieutenant Colonel Chandana Arangalla. “We Are One Sri Lanka” is conducting many community projects in many areas in the North. In another humanitarian assistance by Security Force Jaffna to needy people in the peninsula, 523 Brigade of Allarai, Chavakachcheri, made a donation of a new washing machine to Nivarthana Children’s home, Kaithady. The donation worth of Rs. 35000/= came in through a request made by the Commanding Officer 16th Vijayabahu Infantry Regiment (16 VIR) Lieutenant Colonel Janith Bandara from a donor in the South. The washing machine was handed over to Mr. Visbvaruban, Commissioner, Probation and Child Care Northern Province on 16th October 2014 by General Officer Commanding 52 Division Major General Priyanta Jayasundara. Nivarthana Children’s home looks after 42 male and female children. Troops of 18th Gemunu Watch (18 GW) of Navatkuly, at the same time, gave away gift parcels to all of them on the same occasion. Meanwhile, 18 GW organized an entertaining event with calypso music for 25 inmates at Kaithady Home for visually impaired. They were provided with lunch too. The events were coordinated by Commander 523 Brigade Brigadier Athula Marasinghe. 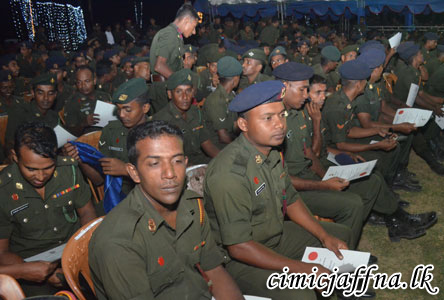 The 3rd and 4th batches of soldiers who followed an intensive Tamil language course in Jaffna received certificates at a pompous ceremony held on Friday (29) evening at Kakesanthurai with participation of educationists, distinguished guests and well wishers in Jaffna. A total of 1815 Army members serving under Security Force Jaffna (SF-J) attended the one month course conducted by Army and civilian instructors at Brigade and battalion level. Tamil language programme for SF-J officers and men commenced early this year on concept of Commander SF-J Major General Udaya Perera with intention of enabling soldiers to communicate effectively with local population so that mutual relationship could be improved. Establishing the identity of the Army as a national organization is another motive of organizing this language course. A plan is underway to make each and every soldier serving in Jaffna competent in communicating in Tamil by September 2015 through such Tamil language courses. Prof. Vasanthi Arsaratnam, Vice Chancellor University of Jaffna graced the occasion as Chief Guest. Appreciating the genuine effort of teaching Tamil to soldiers, the VC said it would pave the way to effective communication between Security Force personnel and civilians. She further said that all universities are planning to start Tamil language courses for Sinhalese students and Sinhala for Tamil students. Earlier, 1476 officers and other ranks were given similar training in Batch number 1 and 2. Batch number 5 is presently undergoing language training at respective places. Reverend members of clergy, Commander SF-J Major General Udaya Perera and Distinguished gusts such as former VC of University of Jaffna Prof. Balasundaram Pillai and Senior DIG Northern Province Mr. Poojith Jayasundara also distributed certificates to course participants and awards to those with higher performance. Course participants presented a short Tamil play exhibiting the knowledge they gained. General Officer Commanding 52 Division Major General Priyantha Jayasundara coordinated the training programme. 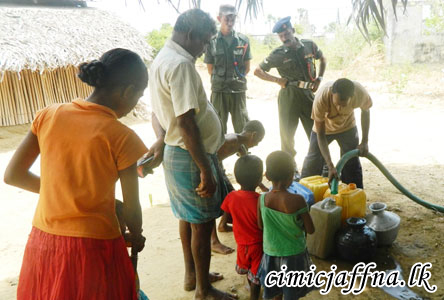 Security Force-Jaffna (SF-J) recently started a new project to buy milk from Jaffna dairy farmers enhancing their economy. 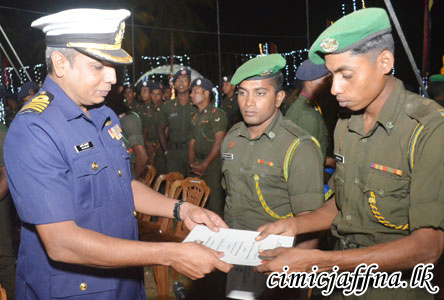 The new project was initiated from February 13th on concept of the Commander SF-J Major General Udaya Perera. 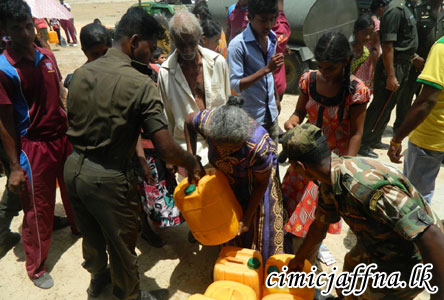 The 5th Sri Lanka Army Service Corps (5 SLASC) of Kankesanthurai daily buys milk from farmers of Inuvil, Suthumalai and Ponnalai at collecting centres of Balasingham Thutharsan, Pathmanathan Thuvanthan and M. parameshwaran. Milk farmers now get extra income by selling their products to the Army. They earlier got only Rs. 48/= per litre whereas Army is now paying Rs. 60/= per litre. It is the fervent hope of the Army to improve economy of dairy farmers of Jaffna and raise the life standard of their families through this project. Milk bought from farmers is used by the 5 SLASC to produce yoghurt for soldiers. The battalion expects to expand the project to some other areas. Kinder Helper Sri Lanka, a Non Governmental Organization based in Kekirawa, Anuradhapura, on request of the Army donated school items and uniforms worth of Rs. 200,000/= to students of 553 Brigade area. With coordination of Commanding Officer 19th Sri Lanka National Guard (19 SLNG), 39 students of Veththilaikerny Roman Catholic Tamil Mixed school and 25 students of Veththilaikerny Parameswaran Maha Vidyalaya were handed over the donation by the organization at a ceremony held recently at Veththilaikerny Roman Catholic Tamil Mixed school. Parents who were present on the occasion were also given packs of dry ration during the function. President Kinder Helper Sri Lanka Mr. I.O. Venkulan, General Officer Commanding 55 Division Brigadier A. Kariyakarawana, Commander 553 Brigade Colonel S.P.V.S. Subhasinghe, principal of Veththilaikerny Roman Catholic Tamil Mixed school Mr. P. Thiruganathan and students, teachers and parents participated in the event. 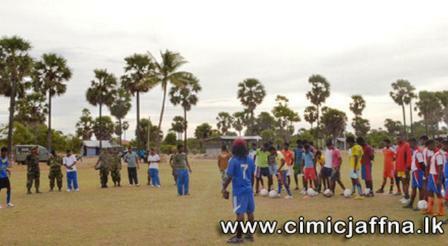 Headquarters 55 Division of Veththilaikerny, in another Civil Military Coordination (CIMIC) affair, organized a coaching camp for football players competing in the tournament organized by the 55 Division for the second year. With coordination of the Civil Affairs Officer of the Division Headquarters and the Commanding Officer of the 19th Sri Lanka National Guard, Mr. S.K.P. 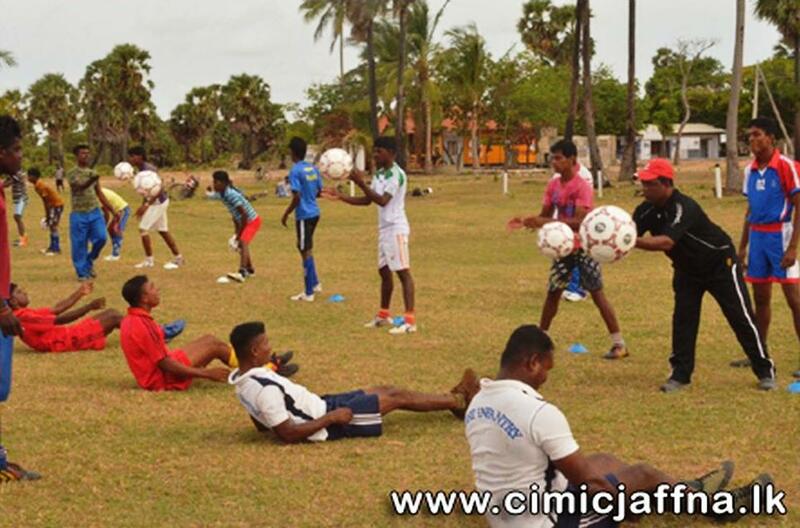 Silva, coordinating officer of Sri Lanka Football Federation and coach national beach football team, Mr. Lakmal Sampath and Mr. Rohitha Kumara, school football coaches gave a two day training to 150 players including youths, soldiers and school players on 05th and 06th September at Uduththurai Senthamil ground.